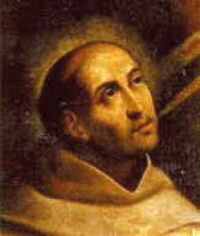 St. John of the Cross (1542-1591) was born and died in Spain. His parents were poor and could not give him training in any trade. Hence he became the servant of the sick in the hospital of Medina. In 1563 he offered himself as a lay brother to the Carmelite friars, who, however, perceiving his unusual talents, had him ordained a priest. When he was about to join the more severe Order of the Carthusians, the saintly Teresa persuaded him to remain and help her in the reform of the Carmelite Order. This reform of his order caused him such sufferings and brought him many trials. But his sufferings served only to detach him from creatures. He had a great devotion to Our Lord's Passion and voluntarily sought out humiliations. When Our Lord asked him what reward he would ask for his labors, John answered: "To suffer and to be despised for Thee." He died of a cruel disease, embracing the crucifix. Because of his profound treatises on mystical theology Pope Pius XI proclaimed him Doctor of the Church. According to the 1962 Missal of Bl. John XXIII the Extraordinary Form of the Roman Rite St. John of Cross' feast is celebrated on November 24.